As you can see on the picture below the big stadium of Milano (San Siro or Giuseppe Meazza, capacity of 85.700) already is coloured red en blue and tomorrow-evening it will be much more. Around 4000 Genoa-fans are expected, while the Curva Nord of Inter ultras has to be empty because Inter-fans offended our Napoli-friends 3 weeks ago. The last match in Giuseppe Meazza twelve years ago on Sunday 9th April 1995 3 ex-players of Ajax: Johnny van ‘t Schip (Genoa), Wim Jonk and Dennis Bergkamp (both Inter) were present. Also tomorrow 3 ex-players of Ajax are expected on the field, but all 3 with the wrong team: Christian Chivu, Maxwell and Zlatan Ibrahimovic. The score in corners was clear: 9-1, Genoa also was the boss in the field by ball possession: 55%-45%, but unfortunately we did not score. 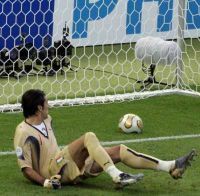 In Holland we name a 0-0 result: bloodless, in Italy they say it was a perfect match because no team made a mistake that lead to a goal of the other team. Genoa Club Amsterdam is happy with the return of Lucho Figueroa, because until now we were almost completely in the hands of Marco Borriello, who scored 5 of our 8 goals and feared Cannavaro of Napoli to score the 6th in his own goal. Marco, I want to make a deal with you. 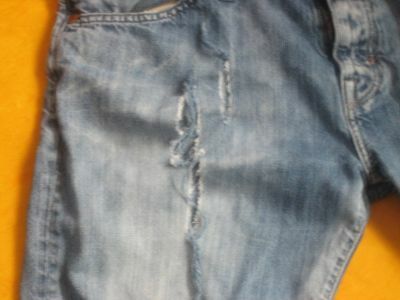 If you score again against Fiorentina you do not have to pay a new jeans for me! Come on guys, after Torino and Napoli also we have to win this weekend. It’s one of the classic games of Italian Football and it is also number 6 against number 3. Of course it means also Preziosi against his rival Della Valle, or Genoa against the friends of Sampdoria. But most of all it is a very important match for the team of Mr. Gasperini after the unlucky defeat in Torino against Juventus. 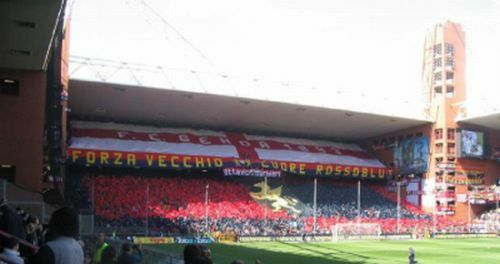 Genoa Club Amsterdam has visited this big match twice in the past. 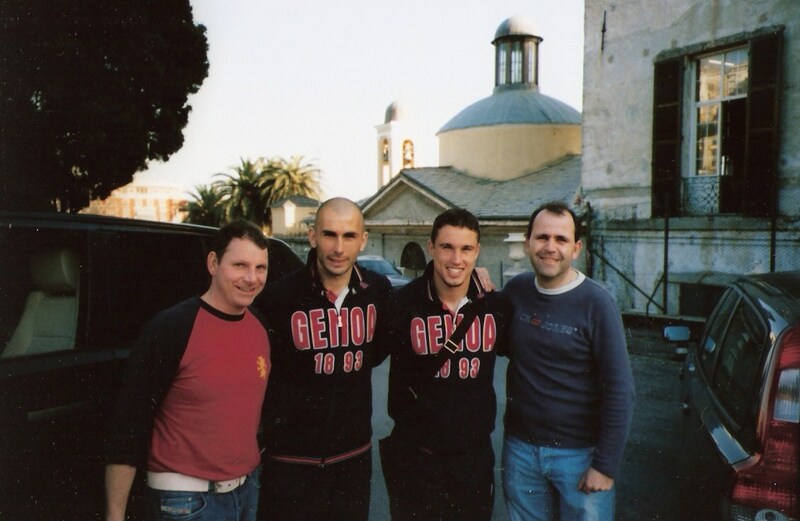 The first time in Serie B on Easter-saturday 10th April 2004. Genoa was the winner of this match by 2-1 with goals of Marco Rossi (constantly victim of the songs of his ex-Fiorentina-supporters) and a brilliant one of Giuseppe Gemiti. The second match was in the 1st round of Coppa Italia last season that was decided by a brilliant header of Genoano Giuseppe Greco. This season Fiorentina is without a defeat so far, but they did not visit Luigi Ferraris yet. This must be an old picture during the Moggi-period of the referee in the shirt of Juventus. 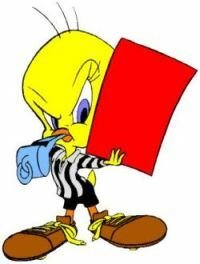 Nowadays it is also possible that a player of Juventus gets a red card. Sunday in the 94th minute of the game Pavel Nedved got first a yellow card after his crazy sliding on the legs of Milanetto and within 30 seconds a direct red card after he jumped in the back of Konko without any possibilty to reach the ball. Today Nedved got a punishment of 2 matches, 3 less than last year after the match against Genoa when he kicked Francesco Bega in the 93rd minute. Also Juventus-coach Claudio Raineri got a red card and he is banned for 1 match. Genoa-defender Alessandro Lucarelli got his 4th yellow card of the season and is also banned for the next match against Fiorentina. 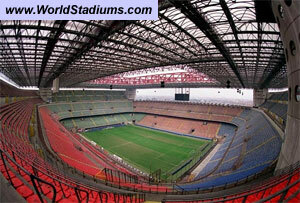 In Italy it is this season also possible to ban a part of the stadium if they destroy the fun of football. Because of their misbehaviour against Napoli the second ring North of Giuseppe Meazza stadium, the place of Inter-ultras, has to be empty against Genoa at 31st October. A good punishment if you insult our Napoli-friends. Genoa deserved at least a draw in the home of Torino, but unfortunately one action of the arrogant couple Nedved-Del Piero decided the match. In the offensive way Genoa did not had enough power to beat Gigi Buffon, the only real star with good manners in the team of the Old Lady. Frustated Pavel Nedved got his almost usual last-minute red card against Genoa after he tried within the last 60 seconds of the match to break both legs of Milanetto and the backside of Konko. Defenders: 3 Bovo, 4 Bega, 16 Lucarelli, 24 Konko, 25 De Rosa, 34 Masiello. Midfielders: 5 Coppola, 7 Rossi, 8 Danilo, 28 Juric, 29 Fabiano, 77 Milanetto. Forwards: 9 Figueroa, 11 Leon, 14 Sculli, 20 Papa Waigo, 21 Di Vaio, 22 Borriello. Ivan Juric and Matteo Paro. Our goalscorer of last season is healthy enough to play tomorrow; ex-Juventus player Matteo Paro has to stay infortunate in Genova. For the first time in more than 12 years it is possible in Holland to watch a match of Genoa live on your tv. The last match was the horrible match Genoa-Padova on Raiuno in 1995 in Firenze, but this time you can watch it on Sport 1, the Dutch sportschannel. After 12 years we are really back at the top !! Mr. Gasperini surely misses Dos Santos and Paro next Sunday and probably the match comes to early for Figueroa, who is not in 100% physical condition yet. Genoa will have the support of 2400 fans in the cold Stadio Olimpico with an expected temparature around 0 degrees during the match. Let’s hope our Rossoblu-boys keep us warm.